John Deere x300 Review - Why get a John Deere x300 tractor? Why do you need John Deere x300 tractor? Get a John Deere x300 series tractor if you are tired of your 'mourning' over the unfinished and untidy 'mowing'? Well here is an easy and reliable solution for you. Now, what is special about this tractor or this series of John Deere x300 in particular? To start off with, if you are looking for a heavy duty tractor to get all of your mowing done, then take a look of this John Deere tractor. This is absolutely the best and most apt choice for the homeowner that has more than just 'another' lawn or lawns. Still, before purchasing this machinery, you would want to have a peak at its incredible features and required to know that the product you are about to buy for yourself, is worth every penny of yours. The X300 series is portion of the John Deere riding mowers that belongs to a selected series that is counted as a range of mowers that are more reliable than ever before released. May it be thick grass, or thin, slippery or dry ground, nothing stands in the way of the superb performance rendered by this machine, without any hassle to the operator. 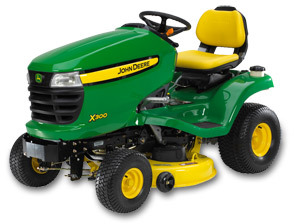 The John Deere x300 exquisite series is referred to be the 'beauty and the beast', all in one. This model comes mainly in two categories, the 38 inch deck, and the 42 inch decks, which are further classified into various sub categories. The two are not much different, in respect of the unique features they have. The difference in deck size contributes to the overall size alteration of the features, and not their quantity or quality. The machine comes equipped with a 17-hp V-twin, air-cooled John Deere i-Torque Power System, providing excellent power, strength and performance, partially contributing to the easy initial triggers and smooth hassle free operation. In the arena of fuel, fuel tank with 3.5 gallon capacity and a large 3-inch fill opening enables it to store handsome quantity of fuel and the process of adding fuel is also made convenient without any prospective spillage. Headlights with 35-watt power are an added design feature which provides maximum lighting efficiency during the complete mowing process, keeping in view the prospect snow removal as well as ensuring the continuous visibility for mowing sessions at evenings. The edge extra cutting technology, alongside the 42-inch deck, is designed to provide an excellent performance. This greatly assists the conversion between the side discharge process, material collection modes and mulching operations, making it no longer a troublesome switch over procedure. A very staunch and sturdy 16-inch turning radius offers superb maneuverability and improved mowing performance efficacy. The frame of this entire machinery was built on a heavy-duty scale, to weld a tough and strengthened support to withstand the variety of attachable equipment and accessories. The professionally engineered and mastered brake pedals have a depressed orientation to apply wet internal disk brakes, which in the longer run, provide augmented durability and longer life. The engine pace and choke controls have been purposely designed and placed separately, to provide warmth to the engine in a colder ambiance. Otherwise, starting up the tractor, or any form of machinery is an issue in the winters. A lift-assist spring has been made available in the John Deere x300 series to minimize lift effort. Lift effort can be pretty conveniently adjusted and adapted to the procedure you want to perform, for optimum performance, all dependent over the variety of equipment being put to use. Comfortable, sit and adjust high back seat are some of the unique features this model has to offer. Travel springs adjust for the operator's weight, permitting fine tuning of suspension. The open back design feature allows proper air circulation which helps keeping the user's back dry and cool, to make up for a comfortable ride. Mower deck height of grass cut is being controlled with a rotary dial knob, in John Deere x300 models, 38" and 42" deck which ensures to provide mower cut height ranging 1 to 3 inches on average, along with a deck leveling gauge provided onboard and placed at the center of the adjusting knob for the cut height.